One of the most beautiful sights that would greet us during Christmas is snow. It may be cold and wet but there is something about it during Christmas that makes it all so exciting. The resplendent image of white Christmas has always inspired some of the best ideas for decorating houses. While the traditional green and red colors of Christmas is lovely and joyful to look at, the serenity and quiet beauty of white gives us a more tranquil but not any less beautiful feel of the season. If you happen to want to try something new this year, try going for the theme of white Christmas. There are so many fun and creative things that you can do in your house to match the theme and mood. It is also a nice way to catch a break from the rustic colors of red and green. So try out some of these white Christmas ideas this season. The Christmas tree is one of the most iconic symbols of the season. When your theme is white Christmas, it opens a lot of possibilities for decorating your Christmas tree. You don’t have to throw out your old traditional green Christmas tree to stay in the spirit of the white Christmas theme. You can use your old Christmas tree and decorate with white and gold ornaments. You can use unlikely tree ornaments like Santa dolls dressed in white and gold. The overall image is very clean and elegant. Keeping all the tree ornaments in a single white color will also look beautiful as it would contrast with the dark green of the tree. It looks like a scene that you would see on a beautiful Christmas morning when snow has fallen lightly during the night to envelop the world in a beautiful, serene quality. If you happen to like drama and the serenity at the same time, decorating your tree this way is the best way to go. Of course, you can always use a white Christmas tree to keep in the theme of white Christmas. Since a white tree would create a perfect canvas for bright and colourful ornaments, you can use multi-colored tree ornaments that will make your Christmas tree pop. A minimalist white tree would also work well because the color palette that you would be using can pull off a design like this. Your tree could be bereft of leaves and just colored in white. Tree ornaments that would work best with this design would be silver and white. You might think initially that it could be too bare but once you are done, the image is quite beautiful. Of course you could go all-white with your Christmas tree. If you do so, wrap a lot of Christmas lights around your tree because this will highlight the beauty of having it all in white. In broad daylight you might not notice all the beautiful intricate details but when dusk falls and you light it up, it gives off a beautiful white glow that will make your home more welcoming and festive. You don’t need an entirely white Christmas ornament to achieve the white Christmas theme. The ornament could be predominantly white which will already do the trick. So if you want to use white Christmas sock ornaments, you can add patches of color that will contrast beautifully with the white background. 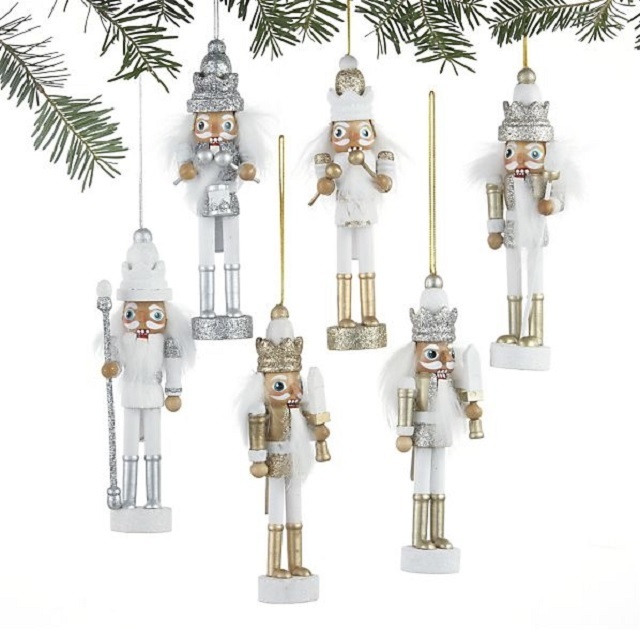 The white, silver and gold ensemble of the nutcracker ornaments makes a great addition to your white Christmas theme. These little cuties will definitely spice up your Christmas tree. Everybody loves a rustic feel because of how welcoming and homey it is. While the more usual colors for a rustic Christmas would be green, red and brown, a very light tan color could work. These Christmas balls will fit right in your white Christmas collection but still retain a rustic feel. Glass tree ornaments are very popular because of how pretty and captivating they look. Also, with the right kind of color and designs, they are perfect for white Christmas themes. On top of your Christmas tree, you need to make sure that you also manage to decorate your house entirely to get the feel of the season. 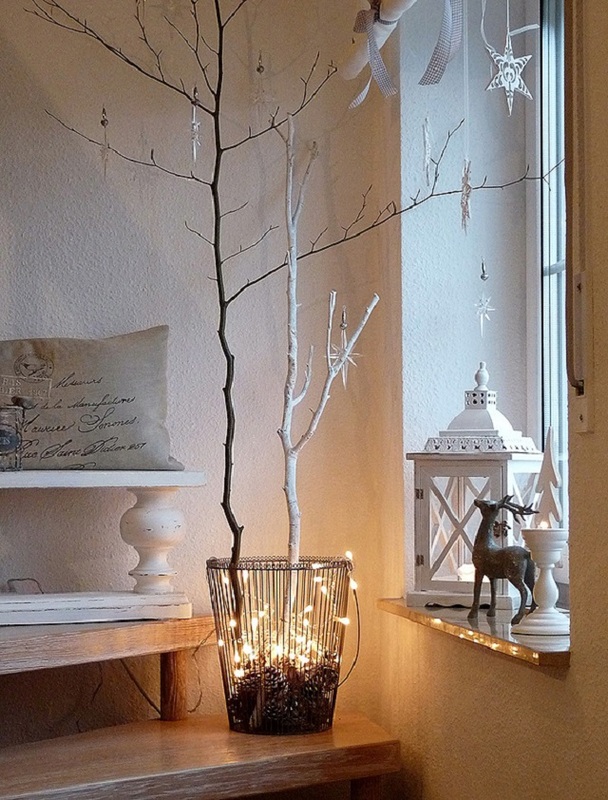 Here are a few white Christmas decoration ideas that you can use. Garlands are pretty to look at and they also make bare surfaces or walls more festive. To get in the spirit of white Christmas, use snowflake garlands that you can hang on your chimney or all around your house. One of the most common Christmas decorations can use a little twist. By using white fresh flowers instead of the usual Christmas balls and ribbons, you will make your white Christmas wreath more interesting and unique. Minimalistic white decorations would work well with this theme. So maybe all you need is just a few Christmas lights, painted dried branches and a few white ornaments and you can already create a table-top Christmas decoration. This cute angel carousel candle holder can do wonders to spice up a bare coffee table. The best thing about it is that it is so neutral that you can even use this the whole year round! Got a lot of empty jars? Don’t worry, you can always utilize them as Christmas decorations. You can add some miniature trees and glue them on the underside of the jar’s cap. Adding snow-like materials such as sand or gold dust would then complete the decoration. You may already have a lot of jars and vases around your home. If you do, you don’t need to take them out during Christmas. You can add Christmas touches by spraying a white, washable pain on your glass jars and some pine cones to decorate any table top. Even though your candle wreath is not predominantly white, it still will fit perfectly in your white Christmas theme as long as you add touches of white like the candles and flowers. If you don’t want to spend too much time and effort in trying to think of Christmas decorations, you can just pile up silver and white Christmas balls in clear jars or vases. If you happen to have some old faux pearl bracelets lying around your house, you can turn them into Christmas decorations that you can either hang on your tree or all around your house. Since the colors of pearls are in the same color palette as what you would expect for the white Christmas theme, it would blend wonderfully with your other Christmas decorations. You can try creating a Christmas ball ornament using translucent buttons and small white beads. The result would be very dainty looking Christmas ornaments that will look great on your tree. If you want to do something really easy, you can try making Christmas stars using papers of gold and silver. String them along to make a garland and hang them all around your home. Taken singularly, they don’t look much. But when they are fashioned this way, they actually look beautiful and very festive. Pine cones are very popularly used during Christmas. But you probably haven’t thought about hanging them on your window as some form of blinds or curtains. Suspend them with a delicate white ribbon from the window sill. Of course the intention is to decorate and not to cover or provide shade so you may not want to hang so much of them. Christmas is a fun time to unleash your creative juice to make your home more festive and welcoming. A white Christmas theme will bring about so many wonderful memories and emotions. Also, there are so many white Christmas ideas that would be perfect for your home. Do you have more white Christmas ideas? Share it here!